(Newser) – The Man of Steel has come to the rescue of some folks about to be booted from their home. 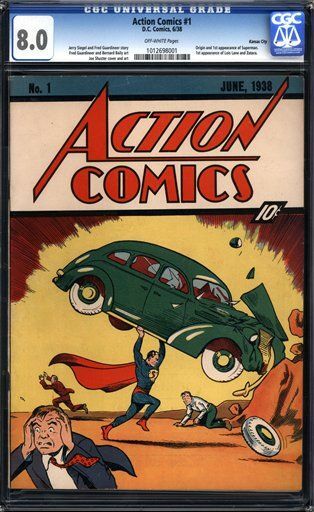 As they packed up to move out of a house that had been in the family since the '50s, they discovered a copy of Action Comics #1 in their basement. The family—all we know about them is that they live somewhere in the South—contacted New York's ComicConnect.com, whose owner told them that the rare comic featuring Superman's first appearance was worth over $250,000, ABC News reports. The company's owner got on the phone with the bank and persuaded managers to hold off on the foreclosure. "My partner basically had to explain to the bank, 'You'll have your money soon. We sent them information about our previous sales and what this could realize," said the comic company's co-owner. "You couldn't have asked for a happier ending," he added. "Superman saved the day." The comic will be auctioned later this month. I live in Superman's hometown, Metropolis IL.T here is a statue of him and Lois Lane here also a Museum.